Our word meteor comes from the Greek word meteoron which means "a thing in the sky." A meteor, sometimes called a "shooting star," can be the brightest object in the night sky, yet meteoroids are the smallest bodies in the solar system that can be observed by eye. Wandering through space, perhaps as debris left behind by a comet, meteoroids enter the earth's atmosphere, are heated by friction, and for a few seconds streak across the sky as a meteor with a glowing trail. How can a particle the size of a grain of sand produce such a spectacular sight? The answer is the speed at which the meteoroid enters the earth's atmosphere. Many meteoroids travel at 60-70 kilometers per second. As a comparison, the shuttle moves around the earth at about 8 kilometers per second. During its trip through the atmosphere, meteoroids collide with air molecules, knocking away materials and stripping electrons from the meteor. When the stripped atoms recapture electrons, light is emitted. The color of the light depends on the temperature and the material being "excited." On almost any night a few meteors an hour will be seen from any one place. However, periodically there are meteor showers, with hundreds of meteors emanating from the same apparent spot in the sky. These showers typically last from a few hours to several days. These showers are usually associated with comet paths, and are caused by debris expelled by the comet. Each day as many as 4 billion meteors, most miniscule in size, fall to earth. Their masses total several tons, seemingly a large amount, but negligible compared to the earth's total mass of 6,600,000,000,000,000,000,000 tons. When a meteorite actually hits, the impact can be tremendous. Many meteorites actually explode on impact or just above the surface leaving nothing visible but a crater. 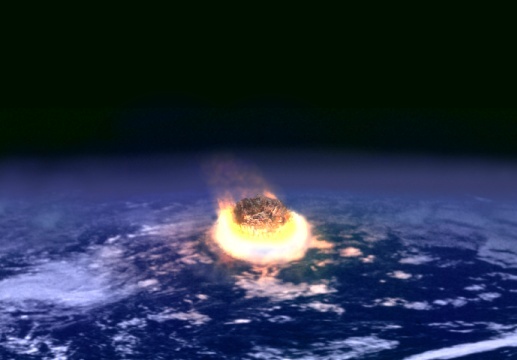 During impact, debris is thrown from the crater. This displaced earth is called the ejecta. It usually contains rocks of different composition melded together called breccia. The shape and size of the crater depends on the size and velocity of impact. Small diameter meteorites (less than 4 kilometers or 6.4 miles) usually leave a round bowl crater, while larger meteorites cause craters with raised centers called the central peak. This peak is caused by the surface's attempt to rebound from the impact. Huge impacts can leave multiple rings in the earth's surface in the same way a rock creates ripples in a pond. 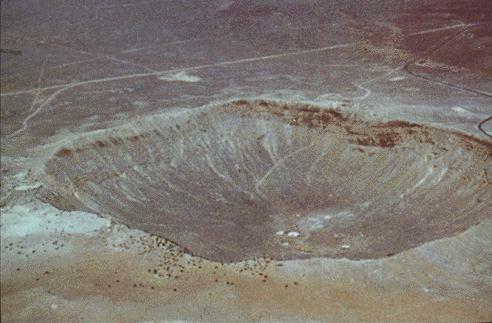 The Meteor Crater in the state of Arizona was the first crater to be identified as an impact crater. Between 20,000 to 50,000 years ago, a small asteroid about 80 feet in diameter impacted the Earth and formed the crater.The crater is the best preserved crater on Earth and measures 1.2 km in diameter. In 1908 a 200-foot-wide comet fragment slammed into the atmosphere and exploded over the Tunguska region in Siberia, Russia, with nearly 1,000 times the energy of the atomic bomb dropped on Hiroshima.